As the need to monitor data centre equipment to ensure efficient operation becomes ever more acute, the amount, complexity and frequency of collection of operational data is growing rapidly. Several trends in online remote monitoring are bringing new capabilities and new efficiencies to data centres. The new white paper outlines seven trends that are defining monitoring service requirements and how they will lead to improvements in data centre operations and management. Although remote monitoring of data centre operations is not a new discipline, it is evolving rapidly into a continuous online process in which reactions to changing circumstances occur with increasing speed, accuracy and automation. A new White Paper, number 237, from Schneider Electric entitled “Digital Remote Monitoring and How it Changes Data Center Operations and Maintenance” outlines seven trends that are defining monitoring service requirements and how they will lead to improvements in data centre operations and management. The power and cooling infrastructure in today’s data centres typically has about three times more data points and notifications than it had 10 years ago. This raises challenges for management with regard to managing both the maintenance data and the data centre itself for maximum benefit. Although remote monitoring is nothing new, notifications were traditionally intermittent—usually transmitted via e-mail—whereas today instantaneous online notifications are the norm. The trends described in the white paper include: Embedded system performance and cost improvements, cyber security, cloud computing, Big Data analytics, mobile computing, machine learning, and automation for labour efficiency. The appearance of sensors, meters, and data collection points in all manner of infrastructure equipment from cooling units to PDUs is driving the increase in systems-management. The use of Big Data analytics and machine learning all help to increase efficiency and emergency response without human intervention, leading to quicker and more cost-effective operations. The white paper also discusses how data centre operations will evolve as a result of these trends becoming more efficient, more easily scalable, and more responsive to changing customer needs. The “Network Effect”, which causes activity to increase in value as more people use it, will become apparent as new insights and methods are derived from the data. Data centre operators should review the digital remote monitoring requirements discussed in the paper as they begin to assess the evolution of their own facilities. White Paper 237 “Digital Remote Monitoring and How it Changes Data Center Operations and Maintenance” is available for free download by clicking here. 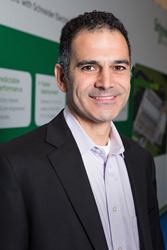 Victor Avelar is the Director and Senior Research Analyst at Schneider Electric’s Data Center Science Center, responsible for data centre design and operations research, and consulting with clients on risk assessment and design practices.